After you reached the minimum payout of adsense, which is 100 US dollars, publishers like us have three options on how we can get our payment from google. First option is the "Standard Delivery" system, where google will send our checks on a snail mail which can reach us within three to four weeks from the date of mailing. 3-4 weeks according to google's estimation, but it could take longer in reality. But the time length on when you can receive your payment is not the real issue for this option. The major concern here is the assurance that your check will reach your hand or not. Especially on our country here in the Philippines where opening of mails in post office is very much expected, we call them crocodiles people. So that's for this option, but I never recommend this, nor anyone as far as I know. Second option is "Secured Express Delivery" system where check will be received in a week, according to google. As the name implies, "secured" and "express", this option is more secure and a lot faster. The only problem is it would cost you twenty dollars, but twenty dollars for a newbie like me (as of now, that is, smile) will hurt much, so I didn't choose this option. But if you're some kind of pro who didn't mind of spending twenty dollars, this is the option for you. 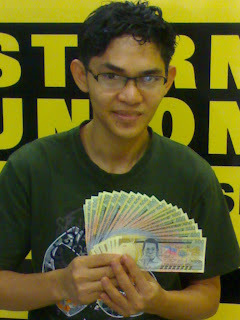 This is my latest earnings from adsense via western union. Can you notice how close those bills are filed up? Third option is the "Western Union Quick Cash" system, which carry both the "fast" and "secure" definition on it. It is fast because you can get your payment the next day the payment was issued on your adsense account. Secure because it's system is under western union, a known international company that use as a money transfer all over the world. And did I mentioned that it is free? 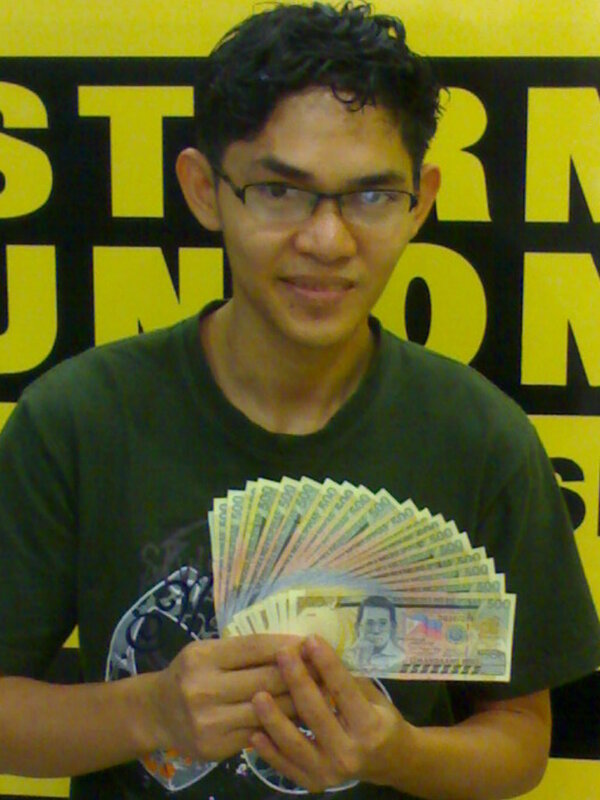 In short, I chose western union quick cash option. I went to a western union center here on our city and told to the teller that I will receive money. So she hand me over a western union form to fill it up, so I did. But there's a field there that ask about your relationship with the sender, this got me confused. I explained it to the teller and she just told me to put "Employer" instead, but of course! So i put on "Employer" on the "relationship to the sender" field and wrote "Google Inc." as the first name, I left the last name blank. I completed the form and hand it back to the teller, which told me to sit and wait for a while for processing. Nervously waiting, I told my wife-to-be to take a picture of me if I receive the money later. I'm a littler nervous, not because I'm doubtful if my transaction will be denied, but because this is my first time having my online income came into reality. After not less than five minutes or so, the teller gave the money. I previously asked her to have the one hundred dollars bill unchanged to my local currency and the remaining would be on five hundreds, since I am withdrawing 145.37 US dollars. So I posed with my hundred dollars and some few five hundred pesos bills and the western union receive money form. The two teller jokingly ask me to get in the picture too, so I told them to smile on my background. We took two shots and what you can see in this post is the best shot. 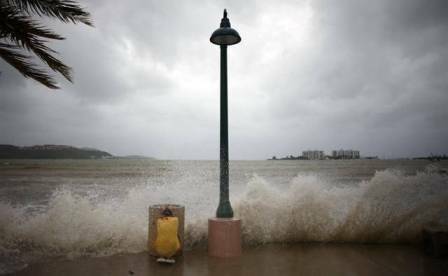 Photo: A boy takes cover from a rude wave caused by hurricane earl in Fajardo, Puerto Rico breakwater on Monday - by Ricardo Arduengo / AP. Hurricane Earl had acquired its name as it became stronger from a tropical storm which is now has a 135 miles per hour wind speed, with a direction of west north west with a movement of 13 miles per hour, air pressure is 935mb. This update is updated August 31, 2010 9pm. Hurricane Earl is now on category 4 - Major Hurricane. According to the hurricane center, hurricane earl affects Anguilla, Antigua, Barbuda, Montserrat, St. Barthelemy, St. Eustatius, St. Kitts and Nevis, St. Martin/Maarten in the northern Leewards. Also, a hurricane watch was issued for the British and U.S. Virgin Islands and Puerto Rico. Image above shows a 5-Day forecast track last updated Tue, 31 Aug 2010 13:02:30 GMT. This feature was only available if you log on your blog at draft.blogger.com, but it seems that the draft implementation has been successful that they finally migrate it to the blogger.com's main page. Now you can see you web traffic statistics without leaving blogger.com. No need to switch to google.com/analytics to view your web traffic analytics generated by google. Pretty neat and practical. This is though a little surprising because this would mean that the users of their own google analytics will decrease. Maybe the google people is just thinking that the blogger.com user is only a few in compare to those who are using google analytics that is not a blogger.com users too. The "Stats" web traffic analytics is located on the last tab on your blogspost blog's dashboard. Images below show the snapshot of the before and after implementation of the 'Stat' tab. As you can see, the 'Stats' tab is now available on the rightmost side. Clicking this tab, you can see detailed web traffic details of your blogspot blog. Below is the dashboard of the new analytics page. I personally found, the"Now", "Day", "Week", "Month" and "All time" tab very useful, anyways, there are lot more on this nice service. If you're like me who use blogger.com on your blog, use this too, it's not that you can remove the tab anyway, heheheeee. I'm very excited to blog this, my very first adsense earning withdrawal. I withdrew my google adsense earning via western union money payment. My adsense earning is just 145.37 US dollars, not that impressive but when you know that it came from your sweat then it's really something! 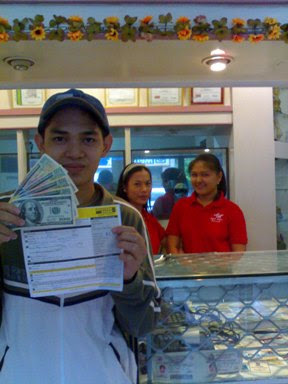 This photo on the left is me showing my western union received payment form. I am also holding my 100 dollars on the front and some five hundreds bills. The two tellers whom I told earlier that I will blog about this joked me to take them with me, so their they are. They also asked me to tag them on facebook. Actually I should have withdrew my adsense earning as early as August 25 but I got confused when I saw the text "Adsense earnings will be finalized by September 10th". I thought that the 145.37 US dollars on my payment details can only be withdraw after September 10th. Researching about this, I have known that your adsense earnings is scheduled for withdrawal every last week of the next month. Image on right shows that I can withdraw my adsense earnings on August 25, something that I overlooked. I'm so nervous when me and my wife went to the western union, my hands are a little shaky when I was filling up the receive money form. It's not that I'm not sure that my withdrawal will be disapprove but it's just because it is my first time. I can't explain why I am so nervous, but I'm sure that you'll experience it too when you receive yours on first time. Maybe it is called over excitement, that something great is about to happen. I don't care if it's just 145 dollars, hey it's my first ever online income came into reality. Things like this really makes me motivated. So blogsphere, expect more from me! Please save this page for the update on medical technologist licensure / board exam results that will be held tomorrow, September 4 - 5, 2010 at University Of The East, Claro M. Recto, Manila. Meanwhile here are the room assignments for the exam. Click link above to download the pdf file. Photo Credit: dcJohn license under creative commons. WATCH OUT FOR THE RESULT UPDATES. Please save this page for the update on geodetic engineering licensure / board exam results that will be held tomorrow, September 1 - 2, 2010 at Manuel L. Quezon University, Quiapo Manila. The list of successful examinees in the GEODETIC ENGINEER LICENSURE EXAMINATION held on SEPTEMBER 1 and 2, 2010. The oath taking of the successfull board passers will be held before the Board on Friday, October 1, 2010 at 1:00 o’clock in the afternoon at the Manila Hotel, One Rizal Park, Manila. If you're just like me, you always want to know your adsense earnings from time to time. I know that it is pointless, because I know that by viewing my adsense earnings from time to time wouldn't increase it, nor would google steal my earnings after an hour. Logging to my adsense account to view my adsense report is really a big downtime to anyone's productivity. Yes, it's pointless and it's a downtime being paranoid with it, but what can I do, I can't help it. It's a bird, it's a plane, no it's a "firefox plugin"! Introducing "WhyDoWork.com Adsense Monitor", a firefox plugin will show your adsense earnings on live feed. The shortest update time is five minutes which is pretty logical, but I set mine for twenty minutes. The update can be custom to five minutes and up but you can left click (default) the notification on your taskbar to initiate the update, just in case you want to update your earnings on that time. Here are some of the firefox plugin that you will get by using whydowork.com firefox plugin. As of today, you can't see you adsense earnings if you didn't log in to your google account. According to whydowork.com, they are currently working on the log-in functionality, but logging to my google account isn't a big deal to me. By the way, WhyDoWork.com Adsense Monitor is the only firefox plugin / addons that is working as of today, based on firefox's official plugin page. This plugin is currently on version 1.4 and was updated last July, 2010. The "Adsense Notifier" by mincus isn't working on firefox 3.6. * version, no surprise because it was updated more than two years ago, April 2008. The same competitor "Adsense Preview" by yellowpipe web was also outdated which is updated on June, 2008. I want to show the plugin in live action but I would need to blur all details except the earnings of the day, so that would mean that everything will be blurred expect for one figure, so it would be somewhat useless. Just try the plugin and see it yourself. Get here to download whydowork.com's WhyDoWork.com Adsense Monitor firefox plugin. When opening your firefox browser, the adsense earning might not show up. Just in case this happened, use the start, stop and reload data options of the plugin on the browser's tools menu, screen shot below. How-to tutorial on searching on website, simple trick. A nicely done website is that it has a search box on it where you can type in a word or phrase and return you all the pages that might contain information that you need on hierarchy. But there are still site (blogsite or website) out there that their creators didn't bother to put a search box for its visitors. Good news, major search engines had already solved this problem for you. You can now use your favorite search engines to search for your specific string query right on the search engine's homepage. All you have to do is to type in "site:yourwebsite.com string to search" and press enter. What would the search engine will do is just to search on that specific words based on that website alone. 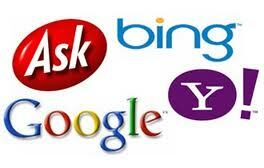 The major search engines that supports this functionality is google, bing, yahoo, and ask. Here is a sample result page from google.com by searching the keyword 'blogging' on this blog, keywordspeak.com. With this trick, we know can make a search on all sites that don't have a search box on them. Just when we think that we are alone in this universe, we're totally wrong. Here's the Voca People! 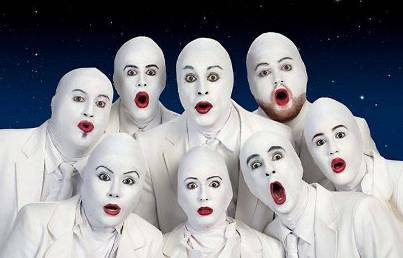 According to their music director, these 'voca people' came from the musical voca planet where all communication is musical. According to their musical director Shai Fishman, these Voca People crashed on their studio, where everything started. If you haven't seen them yet, they have their own official website or you can browse them on youtube. Meanwhile, here are some of their finest performance. I am just wondering why I am receiving traffic based on googlecom keyword. Sure I have targeted googel keyword, but i found it odd why searchers use googlecom. The internet is really full of surprises, there are really lot of potential keyword that could bring you traffic. Though using googlecom as a targetted keyword wouldn't going to give you impressive numbers of traffic, but big things came from small bits right? Meaning that if I could solely target these kind of mini traffic keywords, when combined they can significantly give me traffic right? right! But as of my principle, I will never create a trash post. This post is created to teach surfers on how to do this on the proper way on two simple steps. If you came here using the googlecom keyword, then I presume that what you actually want to do is to go to www.google.com to make a search right? Maybe you heard that google is the most reliable search engine on the net, well, you heard it right, because google.com is really an unbeatable search engine on the net as of today. So here's how to do your googlecom properly. Step 1.) Put your cursor on the browser's address bar. Browser is what you are using when you are surfing the internet. It could be either internet explorer, firefox, opera or chrome. So, that's it! now you know how to use google.com properly. It's not googlecom but google.com and it is type on the address bar, not on the search bar. Google never left us without surprises, now they just have launched Google Voice. Google voice lets you call phone free of charge, for United States and Canada that is. But making international call is insanely cheaper, insanely - the word came straight from them. 1.) It gives you one specific number which is called google voice number, so if you change phone number, your friends will still cal you with your static google voice number, all you have to do is to update your information to google. 2.) Now your google voice is tied to you. Not like today where your regular phone is tied on wire within your geographical location, your home or your office for example. It is not tied to your mobile phone, where a network sim card must be on your the mobile phone that you are holding to accept calls. It is not even tied to your computer where VOIP line needs a specific ip address to accept a friend's call. 3.) It is free for United States and Canada. Now that is a nice thing, since the two countries are heavy tech users. But of course, my fellow non Americans are also hoping that the Google Voice's free service will reach on our country too. US - Canada always enjoy free services like free product shippings, we just hope that we can be considerably included on this one. Get to the official Google Voice site for more information http://www.google.com/googlevoice/about.html. Facebook(ing) is a great way to get in touch with your friends especially your old friends and classmates. 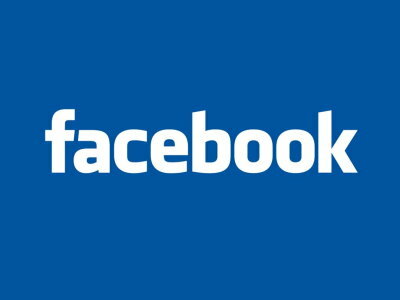 Facebook is a great platform to get updated and one of the most easiest medium to say hi's to your old buddy whom you had been so closed before. Making them friends means that you can see what are happening to them on your homepage. Though I want to know and be updated on what's happening to you by making you as my friends, here are some of the reasons why I would stop monitoring your updates and keeping you as a friend. Sure that's the idea of facebook, you update your facebook account and everyone of your friends can see what's happening on you. But if you post too frequently, then I can find you spamming my account's homepage, and the chance is, your other friends feels it too. Facebook homepage only shows 20 or so friends' update, so if you always have three of yours on my homepage then you are spamming me. With that, I will delete you as my friend. You posted your vacation pictures, posted your self pictures with your brand new car, your sweet photo with your new beautiful girlfriend, your new high end laptop, your new smart phone, pc tablet, etc. The thing is most people hate bragging, and I (we) find that too much. Come to think of it, you know people can get intimidated with those kind of updates. Networking sites' main idea is connect people, how do you think can we connect on that, much more to make a comment. We don't want it, and we don't need it, friend deleted. Okay, for some reason I don't know why, you added me as a friend, out of respect I confirmed your request. But the thing is I don't have any intention monitoring your updates. I just confirmed your friend request because you might be waiting for that email notice saying that I have approved your request. Well, after a day or two, I will delete you. Facebook doesn't wouldn't send you a notice email saying that a friend had decided to delete you. I short, if you think that a person isn't that close to you, don't bother adding them, or they might delete you too, just like I'm doing. These are just some, have you think of anymore? Did Miss Universe Pageant Created A Major Major Regretful Candidate? Philippines' representative to the Miss Universe pageant, Miss Venus Raj had been rained with not-so-pretty opinions over her answer on the question and answer portion. "She could have won the pageant!" - that's the reaction of most people who had seen the pageant if she could have admit that she too had made a mistake on any level and avoided being too perfect. Does somebody without committing mistake lives on earth? The very question most people made their eyebrows raised. Well, let's admit it, it's an easy question in a tense full situation, that's what happend, period. So now, we have the word of the year here on our country "Major Major" which is used on every situation possible. It's not our intention to mock Venus for not having the suppose-to-be crown, it's just that it's funny using it. Meanwhile, here's abc news clip, a proof that Miss Philippines should have title if not that not-so-major answer. 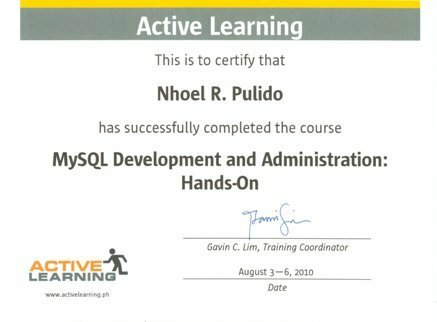 Before, I had blogged about my forthcoming MySQL training at Ortigas City, Philippines. So after five whole days of 8-5 hands-on lectures and seatwork for every topic I got my certificate. My company sent me for the twenty thousand pesos worth of training, but what we actually just need is to have our current database to be migrated on MySQL platform. Honestly, we are using ms access (no reaction please) for our database, and since our need is rapidly expanding, ms access cannot handle our database demand. Since MySQL is free, we decided to have a formal training on how to use it. With that, I got my MySQL training certificate. But this training left me a question, if I have a MySQL certificate, does that mean that I'm a certified MySQL coder? Well, that is a thought I want to enjoy, don't you dare make a comment for this. 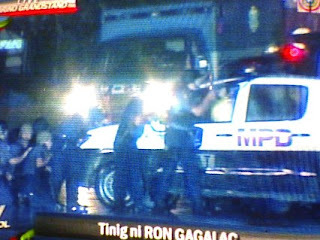 Photo is taken using my N70 phone from abs-cbn channel 2 broadcast. I am currently watching the hostage drama on the television while I am writing this post. Details about the hostage taking is not yet complete, but here are some of the information that I know. 3.) The hostage taking happened on the bus. 4.) The hostage taker released some of the children and old persons. 5.) 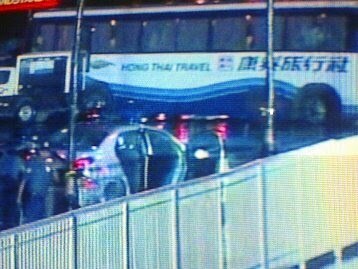 The driver which was previously seen on handcuff somehow managed to jump off the window and escaped from the bus. 6.) 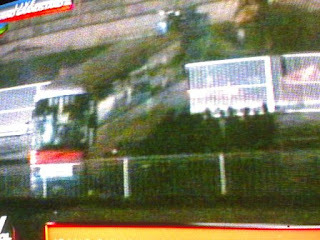 The driver said that all of the remaining hostages inside the bus were all dead. 7.) 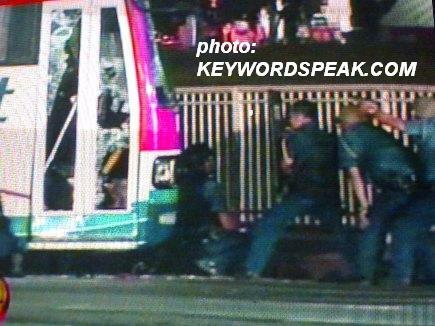 The assault team had attempted to enter the bus, but some gun shots was fired by the hostage taker. 8.) 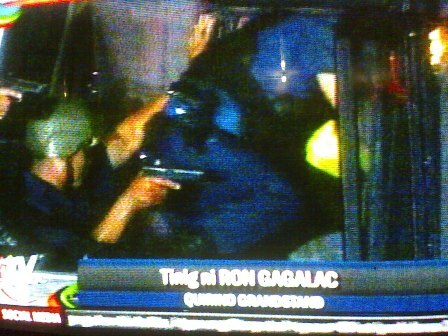 The hostage taker's relatives were all arrested, and taken by force. 9.) Most hostages are foreigners. Media men are all over the hostage area, all channels are monitoring the hostage taking, no commercial break. 14.) 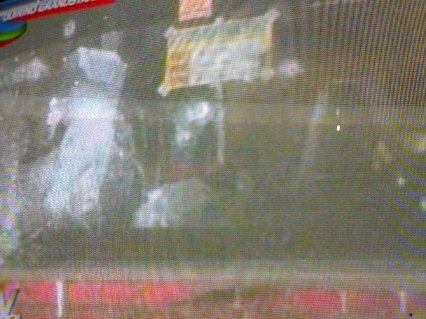 Rain is getting heavier which prevents authorities to pursue any aggressive actions. 15.) 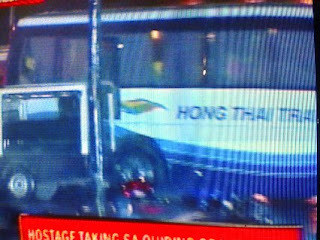 This is suppose to be the last day of the hostages as tourists in the country. 16.) 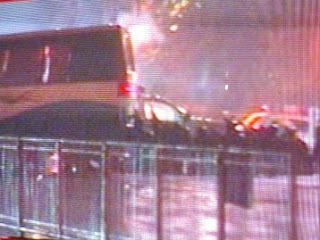 Another tear gas was thrown inside the bus. 17.) 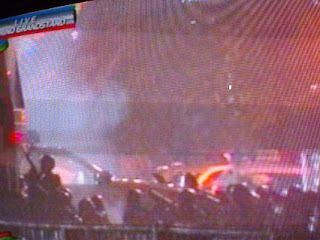 Gun shots were heard right after the tear gas was thrown. 18.) Many gun shots is again are heard. 19.) A body was hanging on the main door of the bus, seems to be dead. 20.) Authorities is trying to confirm if the hanging body is the hostage takers. 22.) 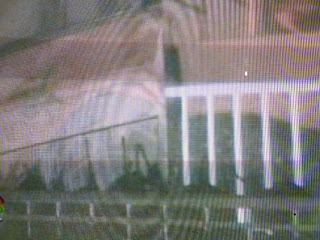 The dead body is confirmed to be the hostage takers, hostage takers is dead. 23.) There are hostages found to be alive. 24.) Ambulance is taking the hostages. 25.) So far, four alive hostages are confirmed and rescued. 26.) 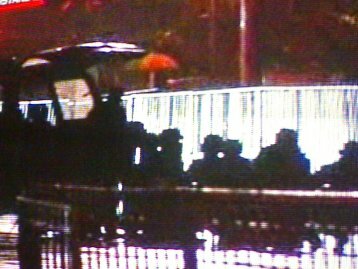 Heavy rain is still pouring on the hostage taking area. 27.) Ron, abs-cbn's field reported said that the authorities retrieved guns and long knives. 28.) A woman was rescued from the bus, the woman is unconscious but was reported to be alive. 29.) Another woman was retrieved, but said to be dead. 30.) Hostage taker was gunned by a sniper. 31.) Two dead persons were confirmed dead. 32.) Another woman on her late 50s was rescued, she's walking. 34.) Another body was retrieved, unconfirmed if it's dead or just unconscious. 35.) The full name of the hostage taker is ex - Sr. Inspector. Ronaldo Mendoza. 36.) Sniper is confirmed to have killed the hostage taker, hostage taker was hit on the head, authorities confirmed to the media on channel 7 that the reporter saw was the hostage taker's brain, according to the reporter's interview to the sniper himself. 37.) The hostage drama is now trending on twitter. 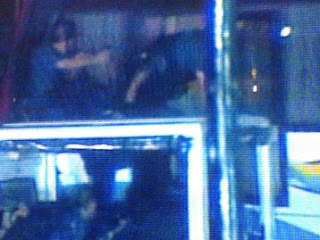 The three pictures above shows that the assault team is trying to get inside the bus. Above - A brave unshielded policeman is trying to know the hostage taker's location. Picture above shows how close policemen on the bus. 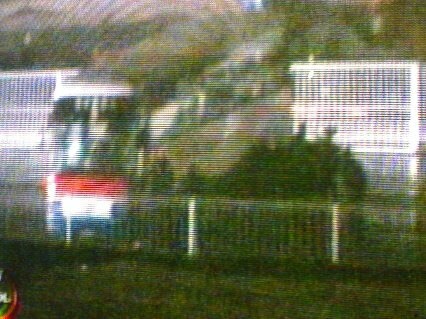 Picture above shows the crowd of policemen with their guns pointing to the bus. Above - A silhouette of the tensioned authorities while hostage taking is still in action. Above - The bus and the authorities besides. 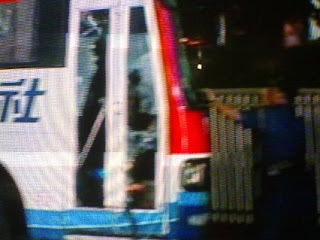 Picture above shows the aftermath of gunshots on the bus' wind shield. The docked assault team with their gun ready. Yes, you heard it right, google who is known to have a focus on online information and sells advertising is know officially entering the hardware market. Of course, if you have the software, then why not have your own brand of hardware that run with it. Though the tablet itself will be made by HTC, who creates mobile devices, but the device will be 100% google's. Also, this iPad killer will be networked by verison. iPad doesn't support flash, which means that it cannot run youtube.com on it, (can you imagine that?). I found a Top 10 Reasons Why You’ll Hate The iPad post. But I actually only need three, first it doesn't support flash, no usb port and no built-in camera. With consumers' disappointmentssss over the apple iPad, people then always seek for a tablet product that could amend these lost necessities. Now here's enter the google brand. Whatever google does, it makes noise, and its official announcement for its own tablet pc shook the tech industry, and yes it surely reached Steve's table too. 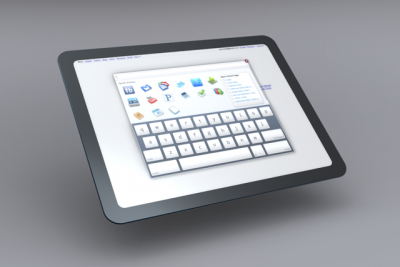 Now here's the iPad killer, google's own tablet pc. The details isn't really clear yet as of today but speculations said that this tablet pc device could be based on NVidia's Tegra 2 platform, will have a 1280x720 multitouch display, 2GB of RAM, a minimum 32GB SSD, WiFi / Bluetooth / LTE connectivity, GPS, webcam, and possibly expandable storage via a multi-card reader. Above is the only official image of this google's tablet computer and no reliable videos yet on youtube. As of now, no onw knows the price yet, but experts said that the starting price should be lower than apple's cheapest which is 499 USD. I'm sure that my fellow Filipinos are also excited with this new device dubbed as 'iPad Killer'. First is, we really hope that it can live its nickname when the real device becomes available and reach our country. 3.) Is google iPad tablet pc is now available in the Philippines | When will it be available? These are the active search terms that buffering the net as this new google iPad killer's noise reached our country. iPad actually is not yet that widely spread over the country since iPad is only available to buy over the counter on major cities, and when I say major I mean really big cities. On cities like where I live, it's either you go to the main cities or you order and wait for your iPad to be ship. Meaning that if this new google's tablet pc is really an iPad killer, then it will immediately (and I mean immediately) kill apple's iPad here on Philippines' soil. Google, please don't dissapoint us, hope you wont launch a just-another-wordpress-blog kind of tablet pc, be sure to kill iPad. I think that I really need to blog this. Taking a break from my regular keyword hijacking pattern. There are lots of funny computer related pictures that I saw on the net, but this one really hit me laughing (from inside that is). Have you seen the 'Press Any Key To Continue' message? I usually see this when I'm formatting a computer. And maintaining a 80 plus computer on our company made this message a common phrase that I see a lot. I haven't made a thought of this until I saw this funny picture, which made me feel like I'm oblige to make a post for this. 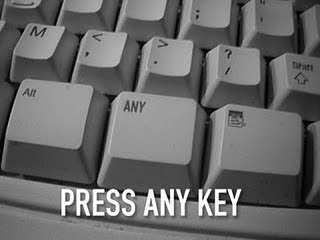 First here is a sample message of 'Press any key to continue' when I am formatting a computer. I'm actually pressing any key when I'm alone for this, and I am pressing the 'Enter' key when I am with a customer's house when I'm fixing his computer because that would make things a little professional (i think). Only tonight I discovered the proper way to follow this message prompt. Now, who would think of that right? Photo: I just received this on email so I don't know where to credit this, please comment if you know. Here are the official list of holiday for the year 2010. Note: Some dates may be moved as Philippines' president discretion. The buzz over the internet whether the August 21, 2010 is a holiday or not has been answered. Earlier, abs-cbn's tv patrol news announced that August 21, 2010 has been declared by malacanang as a non - working holiday. President Benigno Noynoy Aquino III declared the 21st of this month as a non working holiday to commemorate his late father Benigno Ninoy Aquino Jr.'s heroism for our country, thus we will have 'Ninoy Aquino Day'. Ninoy is the wife of the late former president Corazon C. Aquino and the father of the current Philippines president Noynoy Aquino. 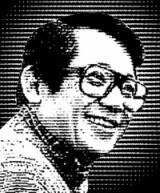 Ninoy was honored on his role for fighting the democracy on our country from the Marcos regime. With this, the whole country will spend this month's 21'st day to remember Ninoy's role that gave birth to our democracy. 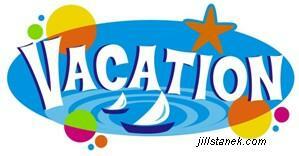 August 21, 2010 is officially a non - working holiday, now that's a good news for us employee and for the students. Definitely a good news isn't it? * Is August 21, 2010 a holiday? * August 21, 2010 working or non working holiday? I was subscribed by jobstreet.com via email so they send jobs offering on my inbox everyday. When I was still an elementary student, my favorite page of the newspaper is the Classified Ads where I can scan different jobs. I don't know but I later realized that it became my hobby until now. With that, I have discovered a job that shook my presence. The job title I saw from jobstreet.com's email is "SEO Specialist". SEO specialist is all about building links on websites pointing to a client's website. I believe that this job is much more better than the popular call center agents job who commonly do their job at night. SEO especialist job pays 50 to 60 thousand pesos a month plus benefits, according to an ad posted this very day. The ad is on jobsdb.com, see it here. As you can see, the job was offered for qualified applicants with a starting salary of fifty thousand to sixty thousand, and to tell you that it is on only entry level, imagine the figure when you became experts for the job. I'm actually thinking applying for the same job after I got pass with a six months ban on my present company. SEO specialist, I think that's me.